← Can Tim Draper Fix California With Your Help? The order, announced early Wednesday morning, was intended as a jolt to a landmark 2006 environmental law requiring an 80 percent cut in greenhouse gas reductions by 2050, compared with 1990. Under Mr. Brown’s order, the state would have to get halfway there — a 40 percent reduction — by 2030. 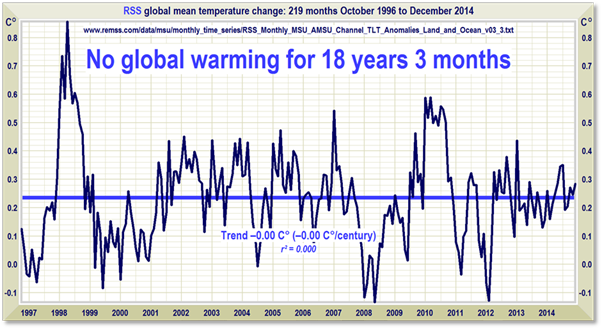 Here is that “every growing threat”, no global warming for 18 years. This entry was posted in California, Climate, Drought. Bookmark the permalink. Brown needs to take a serious look at what’s just happened in Baltimore. A race riot in a city with an African American mayor and police chief and an African American president. Maryland has the highest per capita income in the nation but the city of Baltimore’s per capita income is half the states and I bet in that the neighborhood where the rioting took place it’s worse than that. Baltimore, just like California, has become a place where it’s expensive to do business and expensive to live. The only businesses that thrive are either high margin or well connected to government largess paying costs plus fix fee. Well guess what, poor urban kids with a lousy education who have possibly been arrested for petty crimes will not get jobs in those thriving businesses. They will be luck to get any job even at minimum wage. Meanwhile, politicians just average the high income areas with the low income areas do an average and claim we are doing great. California is a high cost of living state with nearly a quarter of its population living in poverty if the cost of living is factored in. Brown is developing his policies by listening only to those with enough lobbying cash to pay to play. His proposal on green house gas emissions can only be accomplished by further de-industrialization inflicting more pain on the blue collar work force. He’s laying the seeds for rebellion in his own party’s latino political base by catering to the money on the coasts while inland California struggles. Very insightful analysis. CA will soon become the first third world state in the Union, with rich upper class, lower class of poor servants and rebels in the forests and urban no-go zones.